Kenan posts the audio too, illustrated by some beautiful Arabic calligraphy. Mon cher Usbek, aujourd’hui je te raconte le multiculturalisme en Grande-Bretagne. A new article in The Impact of Diasporas: Markers of Identity, a special issue of Ethnic and Racil Studies produced by the Leverhulme diaspora programmes at Oxford and Leicester universities. The issue is edited by Joanna Storey and Iain Walker. This article discusses the historical and geographical contexts of diasporic religious buildings in East London, revealing – contrary both to conventional narratives of immigrant integration, mobility, and succession and to identitarian understandings of belonging – that in such spaces and in the concrete devotional practices enacted in them, markers and boundaries of identity (ritual, spatial, and political) are contested, renegotiated, erased, and rewritten. 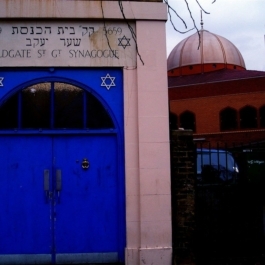 It draws on a series of case-studies: Fieldgate Street Synagogue in its interrelationship with the East London Mosque; St Antony’s Catholic Church in Forest Gate where Hindus and Christians worship together; and the intertwined histories of Methodism and Anglicanism in Bow Road. Exploration of the intersections between ethnicity, religiosity, and class illuminates the ambiguity and instability of identity-formation and expression within East London’s diasporic faith spaces. From the late nineteenth century to the early twenty-first century, there has been a prevailing tendency to orientalise the East End of London. The idioms have changed, but underlying distortions of perspective have remained, from ‘darkest London’ through myths of the Blitz to ‘the new East End’ (Dench et al., 2006; Gidley, 2000; Walkowitz, 1992). This orientalised east London has been framed through (and served as an icon for) two conventional narrative tropes in the history and social science of migration in Britain, one temporal and one spatial. Both narratives are embedded in often-unspoken assumptions about the exercise and practice of citizenship. In particular, east London histories privilege the trajectories of migrant minorities that arrive in London’s lower echelons and are rescued from the abyss through self-improvement and civic engagement. The stories of Huguenot refugees, the Jews of the East End, the Maltese, the Indians, and the Irish are all in some ways redemptively showcased as plot lines of model minority integration. This familiar chronological script is mapped onto an equally familiar cartography as migrants move up, move out of the ghetto and into the suburbs, and leave space for the next wave of settlement. In spatialised Chicago School geography, stories of invasion, succession, and neighbourhood change, as, in chronologies of ladder-climbing minorities, we tend to find cast lists that are relatively unblemished by the presence of traces of difference. The ethnic mosaic is the key metaphor here: it implies social worlds that pass each other by relatively untouched. 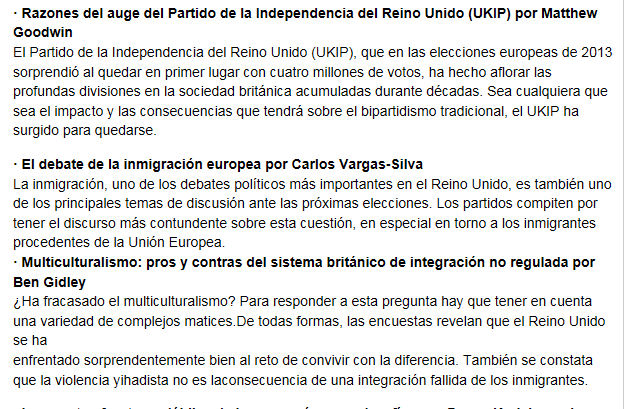 I’m published here, in Spanish, along with a few of my colleagues including Carlos Vargas Silva and Matthew Goodwin. Scroll down for the table of contents, and right down for how to buy. In due course, I’ll publish the English version. My paper “Faith Communities and Racism: Some Reflections from the Anglo-Jewish Experience” has been included in the newly publication by the Runnymede Trust, “Runnymede Perspectives: Secularism, Racism and the Politics of Belonging”. 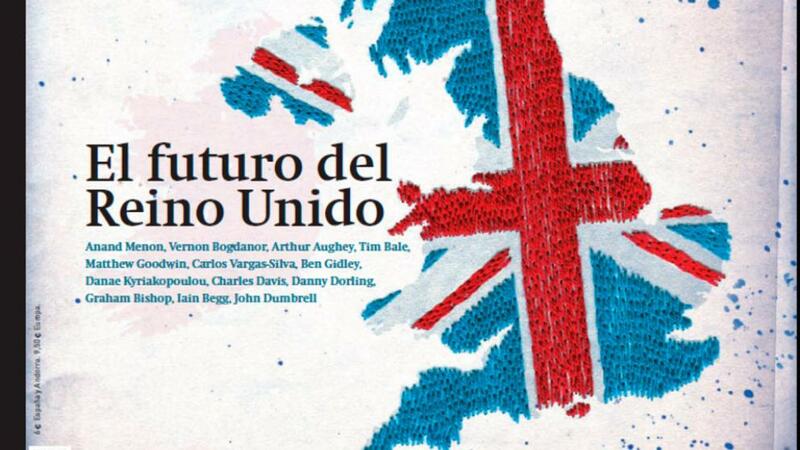 This publication is a collection of papers that were presented at conferences in 2010 and 2011 co-organized by the Runnymede Trust and CMRB – the Centre for Research on Migration, Refugees and Belonging at the University of East London. The contributors address issues of migration, racism and religion. The publication is edited by Professor Nira Yuval-Davis and Professor Philip Marfleet, University of East London. Read the Conference Report by Mary Sutton. Listen to an embarrassing mp3 of my oral presentation. And even more embarrassing youtube of my paper, part 1 and 2.